Ask any Friends of Acadia staff member for their favorite spot in Acadia, and they’ll likely answer, “the place I went yesterday!” With Acadia in our backyard and inhabiting a very special place in our hearts, it’s impossible to choose just one place. Still, a number of spots consistently rise to the top. You’ll probably focus on Mount Desert Island. These suggestions are all in that area. 1) Drive or take the Island Explorer around Ocean Drive. Stop at the Wild Gardens of Acadia, Sand Beach, and/or Thunder Hole. 2) Get to the top of a mountain (any mountain!) by car or by foot. If hiking, take a “South Ridge” trail (for sweeping views) or a trail featuring iron rungs/ladders. 3) Get out on the carriage roads, on foot, bike, ski, or horse. 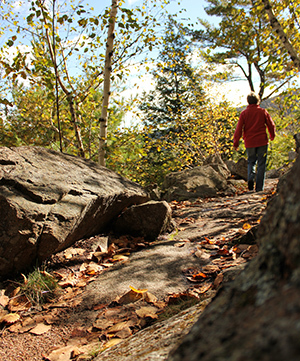 Two recommendations: around Eagle Lake, Jordan Pond Stream. 4) Have popovers at the Jordan Pond House. Take time to walk at least part way around Jordan Pond, and go see the Jordan Pond Gate House. 5) Watch a sunrise or sunset from a pink granite ledge (either at sea level or from a mountaintop!). 6) If you have time, take a boat trip to see Mount Desert Island from the water.